One of the most frustrating events for any gardener proud of their hedge is when they learn that a service such as water, drainage, sewage, electricity or cables must be laid under that hedge that has been developed and perfected over many years. Carefully watered, trimmed, fertilized and perhaps treated for threatening pests. There are many reasons why these services need to be installed. It could be a new service, or the renovation of an old one, or the replacement of one system with another – for example new fiber optics. There is no way to avoid it – they must pass underground directly beneath that lovely, established hedge. What a shame! You are now faced, you think, with years of re-building, because the usual approach to running a trench under a hedge is to dig out two or three of the plants, to make enough room for trenching equipment to pass through. In this blog we will look at a newer technique that makes it possible to run conduit, drains and other services underneath a hedge without disturbing the plants. Let’s take a look. Once the service is then installed, and the soil replaced, there are two options. Some people try to put back the original plants, but in an established hedge those plants will have a very specific shape, the result of years of trimming, and even lining them up correctly again can be difficult. Much more important, it is very hard to remove an established tree in a hedge with a good root-ball. The roots are just too entwined with the trees on either side, and the tree has been in place too long to achieve this without a couple of years preparation. Consequently, an inadequate root-ball is prepared, the tree is often treated poorly while it waits for re-planting, and often allowed to dry out accidently. In most cases these trees that are confidently put back simply decline over a period of months, or even a year or two, before finally dying. They almost never restore the hedge or eliminate that nasty gap. The second alternative is to put in new plants. This is usually a far better option. If the hedge is not too tall, and large replacement plants are used, in a few years they can grow in well and hide the space. But it does take a few years. If this is a 10-foot tall hedge, or more, you can easily be looking at upwards of five years for even a large plant to fill in well. There is another issue too. Are you sure you know exactly the plant species and variety that was used for this hedge? If you don’t, then the new plants will not perform in the same way. The color will be different. They will start and end growth at the beginning and end of the season at separate times. They will have a different growth habit, and a different visual texture. Rather than the smooth, continuous texture and color we look for in a hedge, it will look like a patch-job, always different. If you cannot get a reasonably close identification of the plant used, then you may not even get close to matching at all, and as the trees mature you will have a totally different look in that area. All in all, none of these options look too promising, and they all involve a lot of handling of large plants, expense, and lots of time – with no certain outcome. What to do? Luckily there is a relatively new tool on the market, often already in the possession of landscapers and arborists who do transplanting. It’s called an Air Spade. An air spade is a simple piece of equipment. It’s a hollow lance perhaps 6 feet long, with a spray nozzle on the end. The other end has a trigger control and is connected to an air compressor through a hose. To be effective pressures of 90 pounds per square inch, and air-flow of 200 to 300 cubic feet per minute are used, but the secret is in the nozzle, which is designed to deliver an almost laser-like air blast, the cuts into the soil. This equipment was first developed in the 1980s, but it has only been in the last decade or so that landscapers have begun to use it. The biggest use is for transplanting larger trees and shrubs, which can be done much more effectively with an air spade than by traditional digging. The air spade is used to peel away the soil from the roots, so that almost all of the root system can be exposed, and with a minimal amount of cutting it can be lifted from the ground. This is much lighter than regular dug root balls, so transport is much easier. The roots can then be spread out again in a large hole, the tree staked, and transplanting is successful and easier much more often than by traditional methods. No, the idea here is not to use an air spade to remove the plants from the hedge, but to use it to dig the trench. That’s right. Air spades are widely used today by utility companies to access services for repair more quickly, and thus more cheaply. They are increasingly being used to dig trenches under street trees too, which brings us back to our original hedge problem. If the trench for the drains, new sewage system, installing a water supply, etc. is dug with an air-spade, then it is possible to dig right under the hedge, between two trunks, without disturbing the root system very much at all. 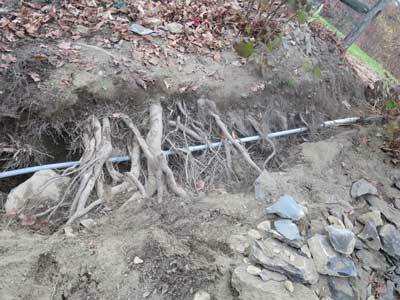 The picture at the lead of this blog shows you how much root is left after trenching close to trees. The same technique can be used through a hedge. The trees will not be disturbed, and the conduit or drain-pipe is threaded through the trench under the roots, with minimal cutting required. Once the soil is replaced, life continues as normal, as if nothing has happened at all. So Next Time You Need to Do This. . .
Air spades are widely available today with many contractors and arborists. So if you find yourself needing to run a service through a hedge, tell your contractor you want them to use an air spade, instead of digging a traditional trench. It should not be hard to find a local contractor who has the equipment and staff to do it. No more dead trees and years of waiting for your beautiful hedge to be repaired, usually with limited success. This equipment can also be used for trenching near trees, and it has saved many specimens from serious damage. Let’s protect our hedges and trees, by encouraging contractors to use air spades instead of traditional, destructive trenching equipment. Congratulations. You have certainly made the right choice – this spring you are planting Thuja Green Giant. Maybe you are replacing that old hedge, or putting in a brand new one, to give your garden structure. Perhaps its is going to be a screen, to protect you from a busy road, driving winds, or for privacy. It could be that you have planted some specimens to create large vertical accents, or an avenue along a driveway. Whatever your reason, after careful consideration you have chosen the best, and certainly the fastest-growing, evergreen there is. But even the best can use help to perform at the top of its game. They say the first year is the most important one for babies, and its also true for plants. That first growing season, from the preparation of the planting area to the last trim of the year, will set your plants up for top growth, good health, and a trouble-free life. There are some basic things you can do that will create that good start, so let’s look at some pointers on giving your Thuja Green Giant a terrific first year. The year starts with planting, and there are some things you can do that will make it a success. Before even that, if you have received your potted trees, and you are not quite ready to plant them, don’t forget to keep the pots moist. If the weather is warm those plants can use a lot of water, and pots may need watering every couple of days. First, don’t leave them in the packaging, but unpack immediately, including removing any string or wrapping. Once you do that, examine the soil in the pots. The chances are it will be a little dry, as plants ship best in that condition. If it is, give the pots a good deep soaking, until water flows from the bottom of the pots. Put them in a partially shaded spot – afternoon shade and morning sun is ideal – for a few days while they recover from the shipping. If you are holding them longer than that, move them into full sun, leaving a foot or so between each plant – don’t crowd them together. Every second day check the soil in a few pots, chosen at random. Once the top couple of inches are dry, water thoroughly, again making sure the water drains out the bottom of the pots. Repeat as necessary until you can do the planting. Don’t be in a hurry to plant – those trees will be fine in the pots, even for a month or more – just as long as you water them. Preparing the planting area well takes time, so don’t rush it. The critical thing is to create a large and deep area of loosened soil, so that the new plants can send out roots to establish a large root zone for water and nutrient collection. You should dig or rototill at least 12 inches down, in a strip at least 3 feet wide if you are planting a hedge. If you just dig a hole a little bigger than the pot, and plant into that, there is a good chance that the surrounding soil is hard and compacted – an inhospitable environment for roots. As well, adding organic material is always a good idea – it enriches sandy soil and holds water, while improving drainage in wet, clay soils – it’s a win-win for every soil type when you use organic material in your garden. Especially if your soil is poor and your garden new, adding beneficial soil organisms as a biological supplement is a good idea. Soil may lack the correct bacteria and fungi to release nutrients from the soil, and these soil conditioners will bring them in. Look for a mixture that has mycorrhizal fungi spores in it. These amazing organisms form symbiotic relationships with plants by interacting with their roots. There are two kinds, and both should be in your conditioner. Ectomorphic mycorrhizals grow in a cylinder around the tiniest roots of your plant. Endomorphic mycorrhizals grow right in between the cells of the roots and spread out into the soil. Both forms collect nutrients from the soil and exchange them with the plants. These organisms can really boost growth, and they are best added at planting time. Incorporate them into the soil that you put back around the root balls when planting. If your plants have been well-grown, there will be a strong mass of roots in the pot. When you plant, these roots need encouragement to spread outwards, and even more important, they need to be stopped from circling around the stem, becoming girdling roots that can strangle the expanding trunk of your trees. Fixing this problem is easy – just take sharp knife and cut from top to bottom of the root ball at three or four points around it, cutting through the outermost layer of roots. Sounds scary? Don’t worry, its arborist certified as the correct and best method, so go ahead – it won’t hurt, promise. Instead it will help your trees develop and establish quickly, and prevent problems developing further in the future. When planting your trees, plant them in the ground, not underground. In other words, the final level of the plants should put the top of the root-ball at the surface of the soil, not buried several inches underground. Deep planting is a terrible mistake, that can lead to poor growth and future trunk problems. Put soil underneath the root-ball until it is at the same level as the final soil. Kake sure you firm down the soil underneath, so that the root ball doesn’t sink into the ground – it can happen. If your soil is heavy and often wet, planting on a low mound, perhaps 6 inches above the surrounding soil, will improve the air-supply to the roots – an important requirement for all plants. By far the biggest cause of poor growth and plant loss in the first year is watering problems. Remember how those pots needed regular water? Well for a while after planting that is what you have – pot-sized roots sitting in the earth. Those are the only roots that can bring water into the plant, and that small root ball can dry quickly. When planting, it’s important to firm down the soil around the roots – don’t leave air pockets, as these prevent water moving from the soil into the root-ball. When watering in the first year, water the area where the root-ball is, and a little further out. Its best to let a hose soak each plant at the stem, and them spread the water outwards. If you just look at the soil surface, it may look damp, but the roots themselves can be dry. Usually twice a week for the first month or so, and then once a week for the rest of the year is ideal. In that first year, use a liquid hedge fertilizer as directed for the particular one you buy. That is often every two weeks, or once a month. Liquid fertilizers are best in the first year, because the nutrients flow right down to the roots and they are absorbed immediately. Granular and slow-release fertilizers are ideal for later years. Finally, trim an inch or two of your plants as soon as they start growing, and a couple of times through the season. Waiting until they are fully-grown is a big mistake – you want to build good structure right from the start. If you follow these tips, at the end of that first season you will see excellent growth and development. In the second year your trees will really take off, and before you know it you will have some real green giants in your garden. Choosing the right plant for the right place is often a bit of a gamble. It takes a lot of experience with your local conditions to know which the best plant for a particular purpose is. When you are planting a screen or hedge, which means buying a number of plants, the choice becomes even more important. This is likely going to be the backdrop to a major part of your garden, and in place for many years, so its natural to be concerned about the choice you make – and to get it right. When it comes to evergreens, that choice is a little easier, because there is one evergreen that literally stands head and shoulders above the competition, and it is very often the right choice. This is Thuja Green Giant. By any objective standards, for a larger screen or hedge across most of the country, it’s the top pick. Millions of gardeners have chosen it, and they have not been disappointed. 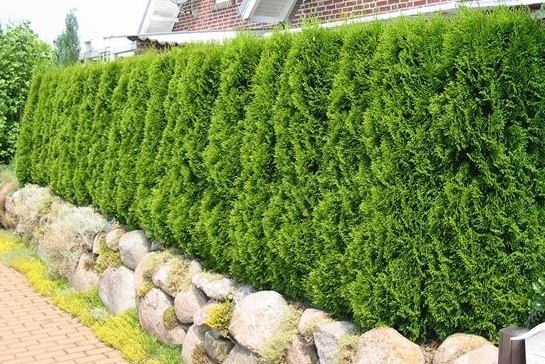 If you are wondering what evergreen to choose for that new hedge, then here are seven reasons why Thuja Green Giant is probably your best choice. If it isn’t the right pick for your particular circumstances, after looking at these reasons you will know that too. Quick Growth – a tiny plant will be 10 feet tall in 7 years. Growth rates of 3 feet a year are common in young trees. When planting evergreen screening or hedges, nobody want to wait 20 years for it to grow to a suitable size. Thuja Green Giant is proven to be the fastest growing evergreen, not only in the early years, where it can add 3 feet in length to its strongest shoots, but over the longer haul too. Trials at the University of Arkansas showed it to be faster than any other evergreen, reaching 10 feet tall in 7 years, from a small plant. Start with 5 to 6 feet trees, and you will be 15 to 20 feet tall in 6 or 7 years from now – tall enough for almost any screening need. Not only is this remarkable tree fast-growing, but it grows into a large plant. Mature trees are 30 to 40 feet tall, in about 30 years, and they are 12 feet across. Now this may be exactly what you need. If you have a large space to fill, or you need plenty of height, then you have made the right choice. If you don’t have the room for plants this size, then you can off course trim them, as you will anyway for a hedge. But if you want to just let them grow into a more natural screen – something this tree does well – then make sure you have allowed enough room for their final size. Plant at least 6 feet from buildings, fences, driveways, paths, etc. Remember too that if you plant on the south side of your property, a 30 feet tree throws a long shadow, and an excessively-tall hedge may put you in shade for 4 months of the year or more. For a smaller screen for smaller gardens, choose Emerald Green Arborvitae instead. From winter lows of minus 20, to areas where it hardly ever freezes, Thuja Green Giant will thrive. In hotter areas it does need water, so if you are in a hot and dry region, you may do better with the Italian Cypress. In areas with cold winter, Emerald Green Arborvitae is hardy to minus 40, so its always the top choice where the mercury reaches the bottom. 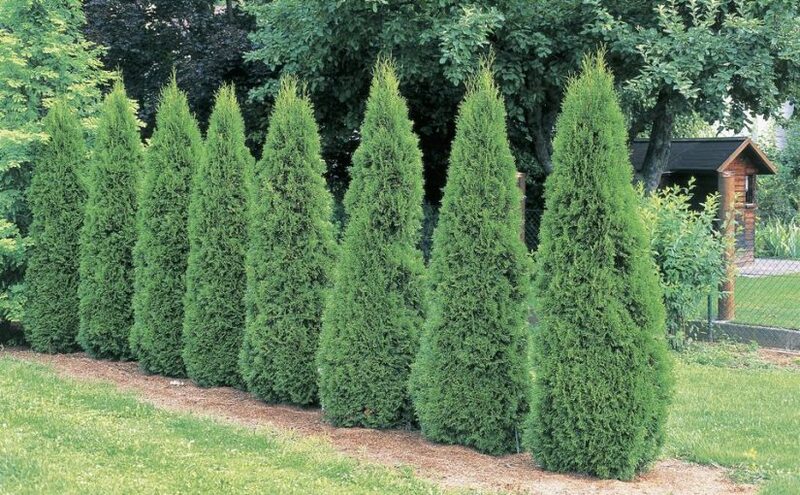 For everywhere in between, which is most of the country, if you are choosing Thuja Green Giant, you are choosing the right plant. You won’t see winter burn, and your screen or hedge will be green all year round. Remember to soak the ground below new hedges in late fall, before the ground freezes. This will protect them from any possibility of damage. Unlike other evergreens, where diseases can strike, and pests take over, this is one tree that is almost certain to stay pest free. Nobody wants to be spraying chemicals, and you won’t need to with a tough plant like this. Even if the occasional pest is seen, with such rapid and vigorous growth, the trees will soon recover. Even better, that big four-legged pest, the deer, usually stays away too. Deer are hard to predict, but unlike most other arborvitae, Thuja Green Giant is not bothered by them under most circumstances. Any damage will be minor, and re-growth is so quick. Nobody likes to have the chore of hedge trimming. 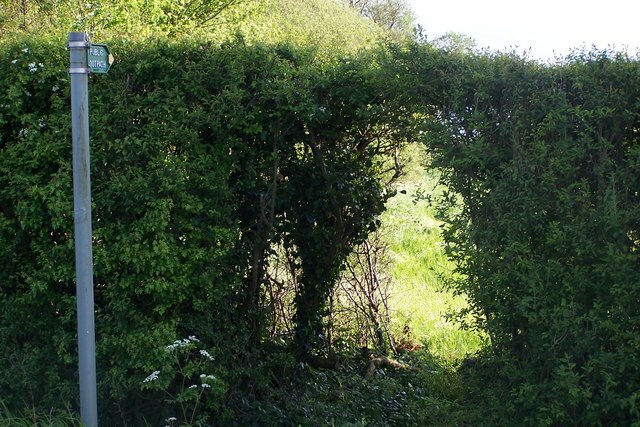 Especially for larger hedges it can become complex, and time-consuming. If you have a larger property, so that the ultimate size is not a problem for you, then you don’t need to trim to have a solid screen. This plant naturally has a dense, upright growth habit, staying rounded and green right to the ground. So planted 6 to 8 feet apart, after a few years they will grow together and make a solid wall of green. It will in time reach perhaps 30 feet, but if that is not a problem you can put your trimmers up on Ebay. Some evergreens turn brownish in winter, simply due to the cold. This is not a sign of damage, just a natural reaction to low temperatures. The problem is, it means your lush green hedge does not look so great for several months of the year. With a hedge of Thuja Green Giant, winter bronzing is someone else’s problem. So every day of the year you will look at a lush green hedge, winter or summer. Some fast-growing trees, especially deciduous trees like willows, and some evergreens too, have a limited life-expectancy. After a decade or two they begin to look sickly, and branches break. Sections can even die back, leaving gaps. Diseases are more likely to attack, killing part or all of the tree. It can feel like you only just planted them, and they need replacing. This won’t happen with Thuja Green Giant. 30, 40, 50 years from now your trees will look great. We know this from specimens around the country, including the original plants at the National Arboretum. So once you plant them, you can forget about needing to replace them. Let’s just hope they don’t get spotted from outer space, because alien abduction is about all that is going to take them from you.